Because I'm nothing if not a thief, I'm stealing the illustration from OHmommy's blog. A day late. Hopefully not a dollar short. And because everyone who reads my blog is brilliant and witty, I know you'll all participate. Right? Right?!? Please? You know you're out there. I know you're out there. You read. You chuckle. You shake your head. You think, "I couldn't possibly comment." Even if you just leave a little smiley face - like this :) - please leave a comment? It's de-lurking day 2010 (or it was yesterday - pretend it is today). You're pretty. Keep up the good work. I always miss the good stuff!!! So you want more comments? Is that the deal? Me too! This week has been bad for me - I manage to read blogs but taking the time to comment is beyond me some days! Have a good one! I'm not a lurker - I just haven't commented lately! I'm still reading, though. I wish I had the ability to lurk....If I read....I have a hard time not commenting. 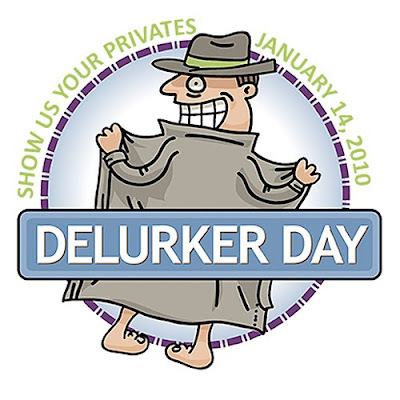 Happy De-lurking Day. Happy New Year Beautiful! I am still lurking around here somewhere-even working on maybe posting something on my own blog! Maybe. Blessings on your family in 2010. Huh. So I'm even later than Cecily. Is that a record? :) Because I? Am a MASTER lurker! I have been a little lurky lately. But you know me! Found you via Warty Mammal ....Laughing all the way down to here!